On June 10, 2018, we bought 10 year old, 16-hands in height Bay mule named Frank. We didn’t go look at Frank. We purchased him sight unseen and based on our conversation with the owner. We were told that he was left in a pasture for 5 years with a mare and no one working with them. We were sent some pictures, the price was right at $250, so we decided we would just role the dice and get him hauled down here. Our friends Larry and Paula from Riverdale Stables volunteered to pick up Frank in Placerville and brought him down to where we’re staying in Bakersfield. Frank is a very friendly mule with a sweet personality. In addition to calling him Frank, we’ve nicknamed him E.Boy, short for “elephant boy”. When we go out in the morning to catch him, he’s usually hundreds of yards away, but we can spot Frank E. Boy very quickly because of his size and because he looks like a rogue elephant walking across the savannah. Little Girl and Frank are becoming good companions. They seem to get along well and enjoy each others company. I always find them together in the pasture. Frank has a very kind demeanor, so I don’t worry about him trying to kick. He is just resistant of having his feet worked with. Before purchasing Frank, I was told that he would stand quiet for a farrier, because that was one of our main concerns. 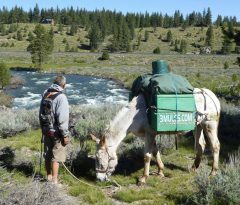 Because the way we live traveling across the state, city to city, county to county, our mules have to be shod. They have to have shoes on them. So, we need a mule that will stand quiet, that is easy to shoe, that won’t put up a struggle. Frank also has a small bump on his rear cannon bone leg. Whether this is going to give him a problem when he starts packing weight, we won’t know till we start doing that. But right now, he moves around fine. He shows no signs of it causing him any trouble. So anyway, Frank has not been fully vetted for road duty. He may work out to be great, or he may just have to be a pet for somebody staying in their backyard, keeping the grass down, a companion for another horse, that sort of thing. The other alternate possibility is that he make somebody a great mule that will be using him without the necessity of horseshoes. In the past three weeks, we also have been getting him use to wearing the pack boxes. It seems that he may have had previous pack experience.